Squash has been a staple in the gardens of many for years. It’s easy to grow, and Butternut Winter Squash grows with a sweet and tender flavor, plus it’s easy to peel for quick effortless meals! Waltham Butternut Winter Squash can be mixed into a creamy soup for those cold winter days or it can be sliced up and wrapped in aluminum foil and tossed onto a grill for a healthy BBQ zing. Squash varieties are many! They are colorful and incredibly easy to store and grow. Of course, there’s the added bonus of winter squash being one of the most nutritious crops you can grow in your garden. These hearty fruits will also hold onto their vitamins and nutrients throughout their long storage life. 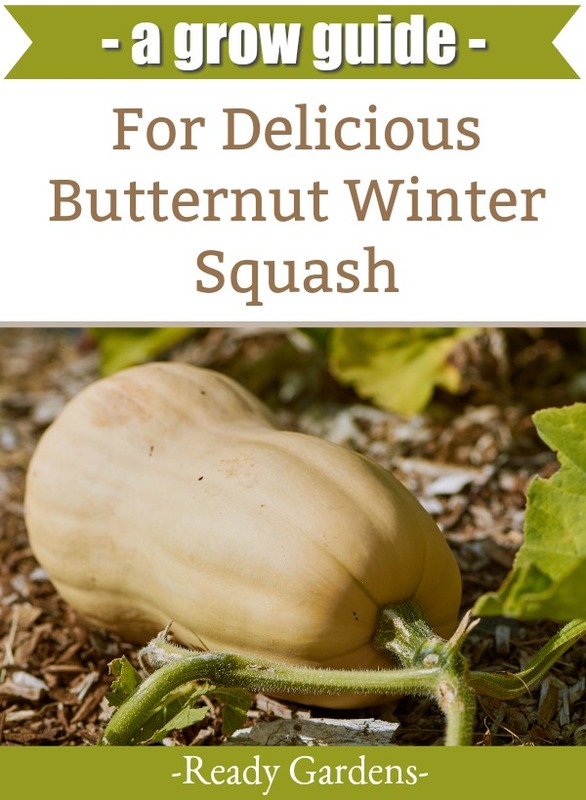 And growing butternut winter squash is so easy almost anyone can have some delicious and nutritious squash available for those winter and holiday recipes! Butternut winter squash is not only flavorful, its good for you too! Butternut winter squash is one of the most popular varieties of squash and with good reason. It contains a good supply of fiber, vitamin A, and potassium. Butternut winter squash is also a good source of vitamin E, thiamin, niacin, vitamin B-6, folate, pantothenic acid, vitamin C and manganese. The nutrients in butternut squash have also been shown to be beneficial for the human body by aiding digestion, blood pressure, keeping healthy skin, and lovely hair. Butternut winter squash has the perfect combination of rich flavor and a smooth texture with natural resistance to squash vine borers. The seeds are relatively easy to sow and won’t take up much of your time or energy, so why not grab some seeds and grow some in your garden? 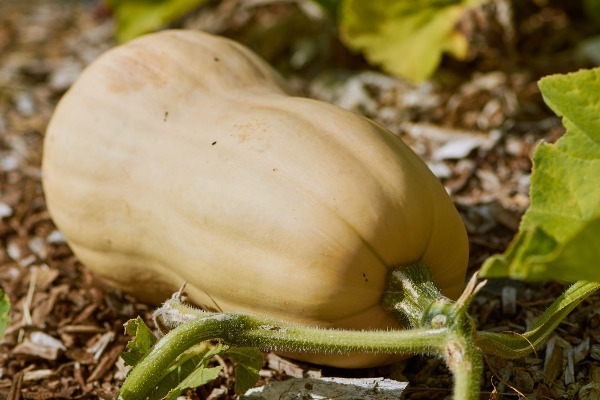 HELPFUL TIP: Butternut squash seeds will only germinate in warm soil, so it’s best to plant through summer. The butternut growing season is approximately 110-120 days for fruit maturation. Thus, if your season is a bit short, you can start the seeds indoors and direct them outside once the weather warms up. However, you will need to transplant the squash before the last frost in your region. Plant the transplants in soil that is “well warmed” by the sun, approximately 60-65 degrees Fahrenheit (15-18 C). Soil should be at about 4-inch in depth. Make planting pockets approximately 3 feet apart. Do this by making a hole about your garden spade’s depth, width, and height. Fill the holes with a mixture of compost or well-rotted manure and soil and sprinkle fertilizer over the soil. Use a small tiller to turn the soil and mix in compost and fertilizer. The soil should be amended and fertilized as butternut winter squash plants are heavy feeders. Plant one plant on top of each planting pocket, approximately 1 inch deep and cover with soil. Water the plants gently with a watering can or spray with a garden hose. Seeds should be planted at the same time as the transplants. The ideal space for growing the plants is a hilly part of the garden and so if your garden has several small hills, plant 4 or 5 seeds on each hill. After they sprout, thin down to 2 or 3 plants because squash takes up quite a bit of space. Powdery Mildew: Caused by Sphaerotheca fuliginea. It starts as a white, powdery growth on the upper surface of leaves, and leads to reduced yield and poor fruit quality. Chemical control is essential, but consider planting tolerant cultivars and control the weeds. Pumpkin Flies: This pest stings young fruit (usually smaller than 10 cm) and lays eggs in a cluster under the peel. Infected fruit rots. To control pumpkin flies, put out bait consisting of Dipterex, sugar, and water when flowering starts. Control with pesticide every seven to 10 days. Fusarium Wilt: This disease is caused by the Fusarium oxysporum fungus. This fungus favors warm soil temperatures. Plants will wilt and die. Fusarium wilt is distinguishable by cutting the lower stem open. Look for stem tissues are light brown in color. To rid your butternut winter squash of this disease, you could plant a disease-free seed; plant tolerant varieties, and adjust the soil pH to 6.5 using nitrate nitrogen. Butternut winter squash will be ready to harvest when the skin becomes hard and is extremely difficult to pierce with your thumbnail. Waiting for the skin to harden is important because the squash can be stored for months without going bad if you can wait. However, you’ll need to harvest the squash before the first frost of the season. Do not wait too long to harvest as they have a tendency to rot quickly if they get exposed to frost. Cut the squash from the vines and be sure to maintain a 2 to 3 inch-long stem on squash. If stems break off or loosen, fruit won’t store well. Gently remove any bits of blossom clinging to the bottom of squash. Immediately after harvesting, you’ll want to store the butternut winter squash inside. Store them in a cool and dry place. Do not refrigerate the whole squash, as it will keep for longer (up to six months) after cured and stored whole in a dark and dry place. Butternut winter squash should be stored at 50º to 55º Fahrenheit with a relative humidity of 60 to 70 percent. If you want the squash to keep for longer, curing is the secret and it’s really easy! Curing is simply storing winter squash at a warm temperature with good air circulation for a period of time, usually 10 to 14 days. Doing this allows some of the water within the squash to leave the fruit reducing the chances of it rotting. Curing also concentrates the natural sugars, which makes the squash taste sweeter and it slows down the fruit’s respiration rate, which enhances long-term storage. During the curing process, the skin becomes harder, forming a protective layer over flesh. That harder skin slows respiration, which ultimately improves fruit keeping quality. The harder skin will also keep the fruit from rotting as quickly and is squash’s secret to long-term storage during those winter months.